I was looking forward to getting a chance to run this race based on the reputation and reading about it in Running Journal as part of the series. Germantown ins a suburb of Memphis TN and I had only passed through the area as a 12 year old so it would be a new experience and area to check out. I had three goals for the race. Run near 1:45, make the podium and gain enough points to put the series title out of reach. Leading up to race morning the weather forecast was not looking too good with rain and in the 40's with wind advisories. We got really lucky as the rain had stopped by the time I woke up, it was 54F and calm. The only thing keeping it from being perfect was light fog and 100% humidity. I arrived an hour before the gun and had no problem finding parking 50ft from the finish line ! 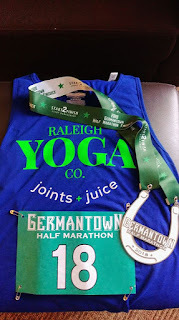 I felt pretty good doing my normal warmup routine and headed on over to the start which we shared with the 5k runners. This was one of the larger races in the series and had about 1,000 runners in the half, nearly the same as the Magic City race. The start was a fast one, flat with just an almost imperceptible downgrade so I had to be careful and not get carried away. And then the shoe came untied. Seriously? I have worn these shoes in a dozen races before and never had that happened. I wanted to wait until after the 1 mile split so I would get a feel for the pace before fixing the issue and before I got there the other one came undone ! By now I was in a group with 3 other guys that looked like possible competition and I was hoping to maintain contact. I hit mile 1 in 7:45, my fantasy goal pace and then stopped to tie the shoes as the trio moved on ahead. I got back up to speed as quickly as possible trying not to expend too much energy chasing the group. It was a long ways to go yet. I had lost about 30 seconds and hit mile 2 in 8:24 and then one of the shoes came undone again just before I finally was closing the gap! I stopped again taking the time to try and make sure I had it fixed before heading off in pursuit once again. I was able to reel in one of the guys on a downhill but the other two had opened a big gap. Mile 3 was an 8:15. By now I was soaking wet from the humid conditions but at least my breathing didn't seem to be affected and I was feeling good. And then just before mile 4 the other shoe came untied again !!!! Grrrrrr ! I got it fixed but lost more time and passed mile 4 in 8:07. So frustrating ! Wouldn't it be something if I missed making the podium due to losing over a minute of time because of stupid shoe laces !?!? Well nothing I could do about it but just settle in and run my race and see what happened. At least I could still see the other two up ahead. Just keep my eyes on them and run. Mile 5 was 7:50 with no more stops and I still felt very good. Other than a few gentle inclines the course was a fast one and I knew from talking to a local the next several would be very flat so my confidence was boosted a bit and I settled in for the final 8. The next several miles were pretty uneventful. I was consistently pacing right at 8mp but the gap between me and the others remained about the same. At mile seven I checked and the gap was about 35 seconds. At least I was still feeling ok and the shoes were staying tied. Maybe I could hang on and get close to the 1:45 and a 4th pace finish would give me enough points. And then about mile 9 the wheels slowly started coming off. A combination of the hard 10k last weekend, the humidity and trying to catch the group was catching up to me. The stride got shorter, the breathing got harder and the energy level was dropping fast. I tried to maintain pace but it wasn't happening as I kept getting slower. I lost sight of the other guys and now I just had to keep pushing as hard as I cold for the last couple of miles and hope no one else caught up to me and there was always the possibility that the ones I had been chasing were not actually in my age group. Cling to what ever hope you can ! Mile 10 was 8:23, mile 11 8:35 and mile 12 was 8:55 as I helplessly watched as grey haired guy pass. I tried to hang on but to no avail. Let's just get this over ! Finally made the final turn and the cruelty of the steepest hill leading up to the 13 mile mark. Ugggg ! Just don't walk but I felt so slow ! 9:08 and then the slight downhill to the end. I at least tried to look good finishing ! I walked slowly to the results tent and saw that I did at least hang on for 4th. That would give me 55 points plus the bonus 25 points for the distance and an insurmountable lead of 170 points in the series. Despite being disappointed in the way the race ended and my time of 1:48:29 being my slowest in years I was elated to put the series championship away. No more pressure ! I walked to my car and stood there as the sweat and water dripped off like I'd been swimming. Texted the number one fan and relaxed. One of three goals met but it was the most important one ! Once again I can highly recommend this race as well as all the others in this series. Everyone has been a first class event. Glad it turned out well....it is a good event!